This is the 4th edition of the 2018-19 Young Bucks Tracker. Last season there was a lot of talk about Milwaukee’s version of “The Big Three” — Giannis Antetokounmpo, Eric Bledsoe and Khris Middleton. Brogdon already has a nickname, “The President,” but maybe he’s due another — D’Artagnan, because he’s become the Bucks’ fourth Musketeer. Yes, Brogdon was the NBA’s rookie of the year in 2016-17, but he averaged only 10.7 points per game. Last season injuries limited him to 48 games with a 13.0 ppg, topping 20 points just five times. Twenty-one games into this season, Brogdon already has six games of 20+ points, including three this past week. In fact, over Milwaukee’s four games last week Brogdon was the Bucks’ second-leading scorer (20.0 ppg), behind just Antetokounmpo. Brogdon, who averaged 29.9 minutes last season, was on the court for an average of 32.7 minutes in those four contests, which trailed only Antetokounmpo (37.3) and Middleton (33.7) in terms of playing time for the Bucks. Brogdon topped all Bucks players who played in every game last week in offensive rating (121.1) and true shooting percentage (72.6). 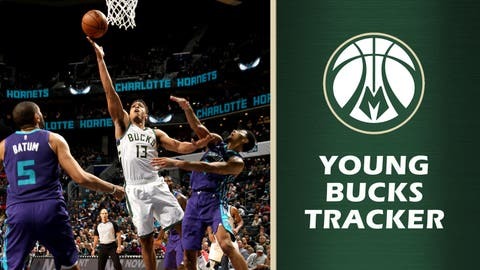 In addition to his 20 points per game, Brogdon averaged 4.8 rebounds and 4.8 assists (with just 1.3 turnovers), made 13 of 20 3-point attempts (65.0 percent) and overall shot 57.7 percent from the field. He also sank all seven of his free-throw attempts and has missed just one all season in 37 attempts. For the season, Brogdon is averaging 151 points, 4.3 rebounds and 3.4 assists while shooting 51.3 percent from the field and 47.4 percent from 3, the latter of which ranks seventh in the league. The way Brogdon is playing, there’s certainly no need to talk about Milwaukee’s “Big Three” any more. One might say it’s all for one and one for all. — In this week’s incredible Antetokounmpo stat: Giannis has seven straight games with 20+ points and 10+ rebounds, averaging 30.0 points and 13.3 rebounds. In those seven games he has 210 points, 93 rebounds and 47 assists. According to STATS, the last player to reach those totals in a seven-game span was Larry Bird in 1986. Antetokounmpo’s name is littered all over the NBA leaderboard and he leads in such categories as player efficiency rating (29.0), value over replacement player (1.9) and box plus/minus (9.1). — Top draft pick Donte DiVincenzo returned after missing five games due to a quadriceps strain. He played just under 11 minutes at Charlotte on Nov. 26 and had eight points, then was scoreless, but with three steals, in 13 1/2 minutes vs. Chicago on Nov. 28. — Guard Pat Connaughton continues to get good minutes, topping 20 minutes in three of four games last week. He averaged 8.3 points, 4.3 rebounds and even 1.3 blocks over his 21.9 minutes. — Khris Middleton has made multiple 3-points in 20 of 21 games. — The Wisconsin Herd acquired the rights (and subsequently added) former Marquette star Vander Blue from the South Bay Lakers for the rights to Joel Bolomboy. In four games he’s averaging 6.0 points. — Christian Wood was sent to the Herd and on Wednesday posted 33 points (on 15-of-25 shooting) and 11 rebounds.